It was time to give my Lee 4-20 bottom pour pot a good cleaning so I fired it up and poured it empty. Well, since I was casting anyway I added a few pounds along the way. 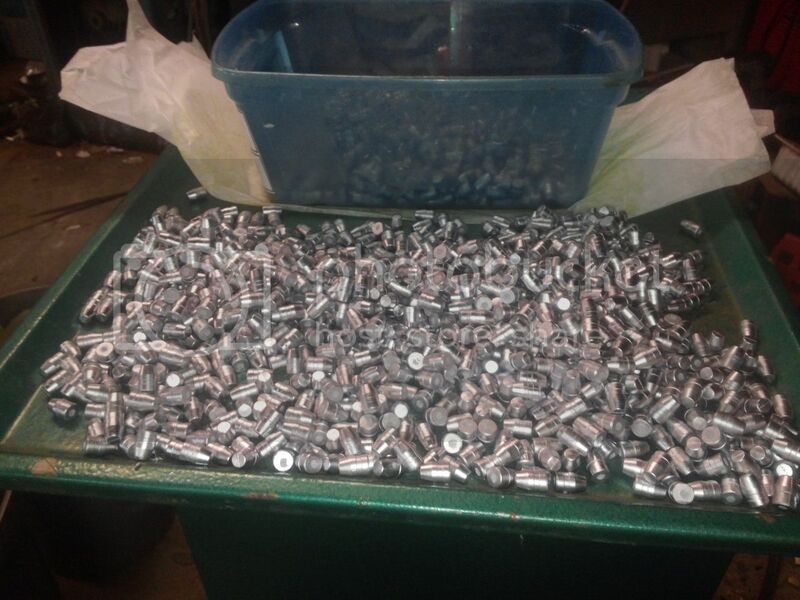 I ended up with a clean pot, tired hands, and about 35 pounds of .40 cal bullets. I'll get them sized and tumble lubed this weekend. I cleaned up the casting area today. Found a few things I was missing, and will probably forget where I placed some of the things I put away. All I had time to do was mic a few boolits I cast last night with a new to me mould, then off to work. It's a shame to have to work for a living. I'm about to load 120 45 Colts for a cowboy match tomorrow. yeah I keep them in the gun room it's chilly in there. I loaded up 50 rounds of 38 Spl. with 3 gr of Bulls Eye under Lee TL358-158 SWC to try out in my "new to me" S & W Model 36 3". The weather was overcast but mid 30s so I tried them out - they worked pretty nice in the 3" as well as the 36 snub. As much as I like RN boolits, I still keep going back to this boolit in my 38 spls. - it just plain shoots good out of "em. I de-primed the spent casings and tonight will start on doing a couple hundred rounds. Loaded 100 roads of my smurff bule 230 grain Lee tl powder coated boolits and cast about 100 320 grain 50 cal reals and flaired the mouthes of about 200 .38 special and 50 30-30. I'm wrestling with new small base 5.56 dies that appear, to size the case so small. That, I can't seat the primer. Is That possible? I need to get in there and size some boolits I want to powder coat. No rush as it is high humidity today and next several days, need low humidity for best result. Get rid of the crimp first. I received my MP Ruger Only mold yesterday and set it up using the cup pins. It will be going in the oven shortly to do a 3 cycle heat treat and plan on casting tomorrow. I loaded some 38 spec. with the old lyman 310 tool. Deprimed/sized over 700 45 ACP and deprimed 300 223 cases, ready to start cleaning if its cool enough to fire up the furnace to dry them tomorrow. Loaded up some NOE 360477 boolits in .357 cases with H110. Loaded up some Lee 180 rn with H335 in .308. Bought a new shelf for the gun room to store coffee cans of brass and what not on. I did absolutely nothing because we haven't found a house yet and have been stuck in an apartment for two months! I'm going through reloading withdrawls. We have a saying in our house: No pity for self inflicted wounds! I looked at my reloading room through teary, OC ravaged eyes, and then went back to sit in front of the fan. Nothing today, but I setup the pot and tools and 30# of alloy for a casting session Saturday, need to cast up a 1000 new .44's for my Henry I go a new mold. It'll take me about 4-5 hours to cast that many. Then I'll need to size and lube em Sunday.